The history of printing dates back to the use of stamps and clay tablet impressions in ancient Mesopotamia, China, and Egypt. The technology has come a long way since then, but the aspects we value most in good printing remain the same: clarity, visual appeal, and the quality of the final product. Here at DISCOVERY PRINTING, we can't say we know too much about clay tablets, but we do have a thorough understanding of modern printing technologies and the ways in which they can enhance the presentation of all types of materials. With a suite of superb printing services available, our Mountain View, California, company delivers extraordinary quality and breathtaking clarity with every printing job we undertake. Our approach is based on one simple idea: our clients deserve the very best. Whether you need banner printing, printed brochures and catalogs, or something else entirely, we'll go the extra mile to ensure your satisfaction. Our flexible, convenient services are perfect for busy professionals. Enhance your next corporate event or boardroom meeting with stunning printed materials from our family-owned shop. If our outstanding quality doesn't entice you, our competitive prices surely will. Printing is a game of quantity, quality, and cost. A good print shop must deliver the amount of printed items you need, with good results, at an affordable price. 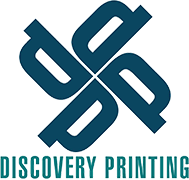 At DISCOVERY PRINTING, we're proud to say that we deliver on all fronts. We're able to print all sizes and quantities you may need, in a timely manner. Our quality is impeccable, and our attention to detail shows in everything we do. For affordability, we're the perfect choice; bring us a price quote from another print shop and we'll match it, simple as that. Our company values our community and we put our many, many years of experience to work for local customers on a daily basis. We're also involved in assisting local nonprofit organizations, in order to ensure that we remain good stewards of this wonderful area. We're proud to be your neighborhood print shop and we hope to establish a strong relationship with you that will last for years to come. Visit us or get in touch today and see why so many customers rely on us for all of their printing needs.